I haven't done a beer review in nearly four years, so why not? This is a Berliner Weisse, a light, fruity, sour style. The raspberry and lime are subtle, as is the sour. This is not one of those sour beers that will blow your socks off. This is something to sip on a sunny afternoon while you watch the world go by. I have often felt like New Belgium's seasonals are a couple of months off where I live, and this one is no exception. March and April can be nice in Flagstaff, but they often aren't. Come May around here, this would be a great patio beer. Just about right for May here, but I suppose if I lived in Phoenix, this would be perfect. Maybe that's why the seasonals are always off here. Turns out Friday the 13th falls on a Friday this year. Spying is a daily reality in the world. Fortunately, Mao doesn't have many apologists in the US. On reflection, this may be a pretty good marketing move. Lots of beers are named for where they are made, e.g. Weihenstephaner. The kind of people who drink Budweiser probably do associate it with America. AMERICA F*#K YEAH! MUSIC VIDEO from the move "Team America World Police" Regular & Bummer Versions !!!!!! This to me is really bizarre, and why I term the piece mendacious: Asian Americans do talk about white Americans the way whites talk about black folks. This reminds me of the time I found out what gwailo meant. I received this beer from the Magistra for my 10 year work anniversary. A mighty fine present. Double DBA is Firestone Walker's flagship beer brewed double strength. I guess that makes it a Double Double Barrel Ale? Double2 Barrel Ale? Since this is a double strength imperial version of an already malty beer, you should not be surprised at how thick and rich this beer is. 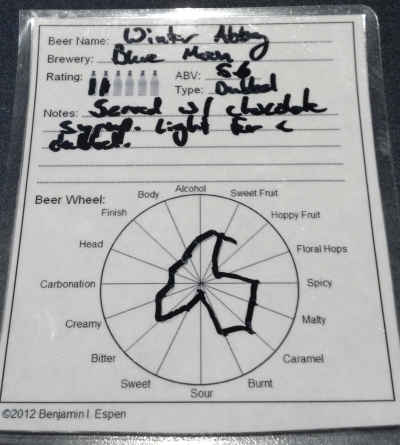 Add barrel-aging on top of that, and you are going to have a very sweet, but also a very deep beer. The box advertised toasted coconut, and I think I got that one, although I missed out on the graham cracker. Thick on the tongue, sweet on the finish, this is a fine beer for sipping in the evening after the kids have gone to bed. Pick this one up, you won't be disappointed. 1 beer. This is a nice beer. Light and refreshing, with just a little hint of sour. This is the first Berliner Weisse I've had, and I am a fan. This was a really interesting beer. I liked the juniper in place of the hops, it made for a very different experience. The beer had a ton of body, which is due to the lack of boiling after the spent grain is removed, leaving behind proteins. I would like to try some other examples of the style. As you might note from the picture, this beer was served with Hershey's chocolate sauce on the rim. A bit unusual, but it really made the beer for me. The beer itself is pretty tasty, but the sweetness of the chocolate was a really good pairing. It was good enough for me to break my usual rule of not giving Buffalo Wild Wings my business. A fun seasonal variant on the Oktoberfest style, usually a lager. The altbier yeast gives this one a lot of body and flavor. I've been pretty happy with Widmer lately. They keep making beers I like. Keep it coming boys. I'm loving the nitro beers. Left Hand Milk Stout Nitro is a winner, and so is this. Using Nitrogen as a pressurizer instead of Carbon Dioxide produces a smoother, less bitter beer. This pairs well with stouts and porters, but I think the Cascadian Dark style is a good choice too. Left Hand has a trade secret on the process used to nitro beer in a bottle without a widget, but you can get a nitro beer anywhere that has the proper equipment for it. I had this one at San Tan's brew pub in Chandler, and it was worth the trip. Hoppy indeed! When I opened the bottle, the hops rushed out of the bottle in a piney wave! There is a pretty stiff hop bitterness, but the red ale base of the beer makes for a pretty solid finish. 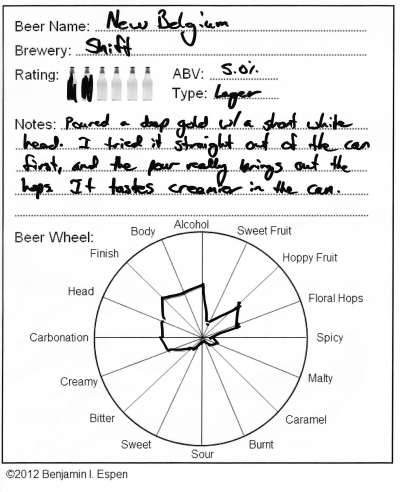 This was a left-over from Strong Beer month at Beer Club. I am not familiar with Rhinelander, so I was uncertain what to expect. I was pleasantly surprised. As an IPA curmudgeon, I tend to be skeptical of all things IPA. In this case, I found a nice beer with good flavor. More beers like this could make me a fan of IPAs. As you can see in the picture, this is a pretty dark IPA. The hops aren't actually that strong either, I think Lumberyard's IPA has more IBUs than this double IPA. 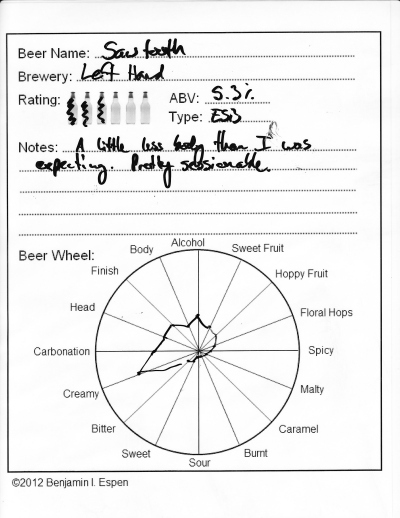 The hops that are present are pleasant fruity ones. On the whole, a pretty sweet beer. IPAs are often sweet underneath the bitterness. Since this one lacks bitterness, the sweetness comes to the fore. This is just a hunch, but it looks like the number of breweries was on a downward trend that was not affected in any way by Prohibition. Our friends at Mother Road Brewery have won a gold medal in the 2012 United States Open Beer Championship, in the American Pale Ale category! Congratulations! For the Magistra's birthday, we received both Left Hand Milk Stout, and the new Milk Stout Nitro! 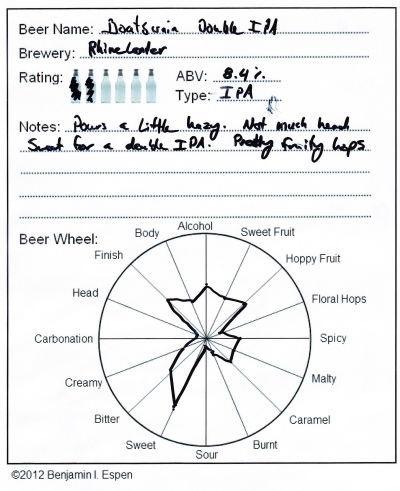 This is an exciting opportunity to compare the two beers head to head. I poured them both as recommended by Left Hand for the Nitro, which is probably inappropriate pouring for the regular Milk Stout, but it is just one way to compare. As you can see, the Nitro on the right poured beautifully. It has a downward falling head, with small bubbles, so thick you could almost stand a fork up in it. 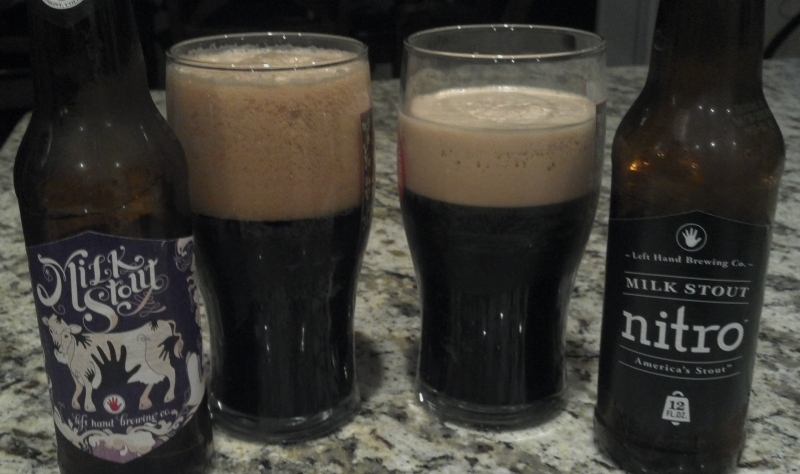 The head on the regular Milk Stout is bigger, with big bubbles that pop on your tongue. The Nitro is less sweet, nuttier, and smoother. The regular is more sweet, but also more acidic, probably due to the CO2. The Nitro is amazingly good! Some nice toasted malts, sweetness from the milk sugars, and oh so creamy. New Belgium's Lips of Faith series is my favorite special line of craft beer. I have more favorites from this line than any other. Clutch. Grand Cru Abbey. Dunkel Weiss. Biere de Mars. You can add Brett Beer to the list. This is a really fun beer, it has a flavor unlike anything else I have ever tried. 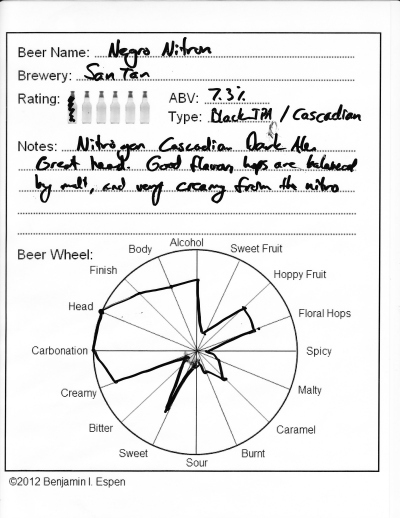 The wild Brettanomyces yeast in this beer gives it flavors of papaya and pineapple! Such a thing! The beer itself is a hazy orange, pouring with a short fluffy head. The hops are subdued, giving the tropical fruits full play. This gives the beer a sweetness, but not an overpowering sweetness. I bought another one of these for the Magistra shortly afterwards, because this beer was so much fun, I couldn't leave it alone. The flavor profile is distinctive. I tried Shift straight out of the can first. It seemed like the right thing to do. It was pretty darn good. I poured it into a glass later, and it actually did change the flavor a bit. I felt like Shift tasted a lot like Lumberyard Red in the can, but in the glass it takes on a less creamy flavor. 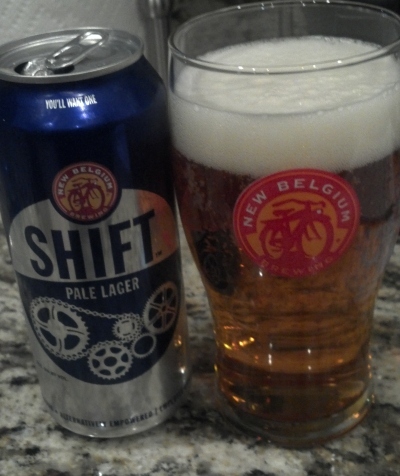 Shift has pretty good body for a pale lager, but retains the lighter flavor profile that makes a pale lager what it is. 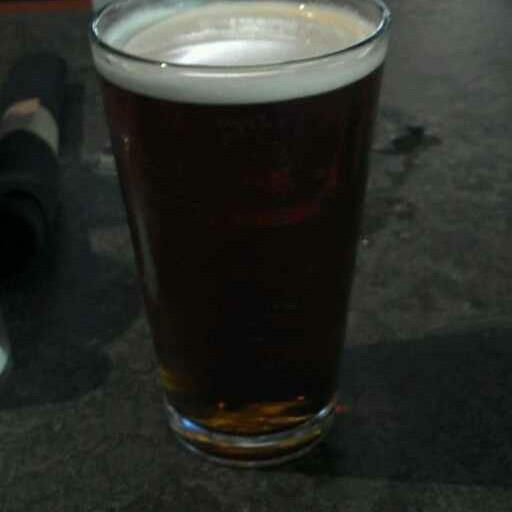 I had this beer as well as the California Gold at Oggi's Pizza and Brewing Company. The Torrey Pine's IPA was my after-dinner beer. This one is pretty strong, very hoppy in the common style these days. A proper IPA, but not bad flavor for all that. A typical IPA. Good for what it is. I do not prefer the strongly hoppy brews, although I can enjoy them. I also don't need to keep the beer from spoiling on the ocean voyage. I had this beer as well as the Torrey Pine's IPA at Oggi's Pizza and Brewing Company. I was staying in Orange Grove near Disneyland, and Oggi's was right across the street from our hotel. I picked the California Gold first because it is a cream ale, and I don't often see those. It was very light in color, and had a nice smooth flavor. I enjoyed this beer immensely. I had a chicken ciabatta sandwich that went very well with this beer. The beer was not heavy at all, perfect for hot summer days. A great microbrew. Light yet tasty, it really is golden. Crisp is a good word for it. Beaver Street Brewery is one of the local brewpubs, and my favorite of the bunch. I purchased a half-gallon growler of this to accompany a sushi dinner, and I thought they went well together. Slightly sweet, with a fruity finish, bananas of all things. Golden in color, not too hoppy. A mighty fine beer. A good Belgian pale ale, with the richness characteristic of all Belgians.